The latest tragic comedy that happened did not take place in a theatre - it happened right here at home on 14th January, the evening of Sankranti or Pongal! It is a Maharashtrian custom to exchange 'tilguls' (sesame seeds and jaggery syrup balls) on Pongal and these come in all shapes, sizes and textures too (hard as walnut shells, slimy as slime balls, perfectly shaped perfectly sized and perfectly made). We received tilguls from four or five people - about 20 or 25 tilguls in all. I am not really fond of anything made with 'til' (sesame seeds) but have some tilguls simply out of habit. Yes, habit!! At certain hours of the day - esp. when I return from work - my stomach does not growl, but the eye balls pop and sometimes the tongue drools or vice-versa at the sight of the 'first edible thing'. The mind/brain interprets these messages as - "Hunger - mouth calling, mouth calling! Over and out!" My hands respond immediately to the SOS by reaching out and grabbing frantically at anything edible in the vicinity and popping it inside my mouth. This is generally followed by a few blissful moments of chewing, swallowing and sometimes guilt too (with enough practice one can push it to the end of the bottomless pit - the guilt I mean!). I started as a novice but now I am almost there and getting the 'pro' tag!! Note: One way to overcome this urge is to keep fresh fruits waiting on your dining table - it works like magic, is healthy and perfect for 6:30p.m. That is what I usually do but that day unfortunately fruits had got over and I gave in to the tilguls. I was in for a cruel surprise. Just as I had mechanically started moving around the sticky jaggery filled sesame ball around and bit into it, I struck ceramic (not gold) and screamed "AAAAH". I had just bit on my 'cap'!! I won't name the person whose tilgul caused the tragedy as decapitated caps can be fixed but fractured relationships do not heal even with time. I don't think I will ever yield to those 'stomach messages' any more (at least not in the near future - read as a week or so:)). The tilgul was not made well as the jaggery syrup had not been allowed to reach the correct consistency - now you know why sweet making may 'read' simple but may not be all that easy! You also know a way of getting back at people - just gift them a generous batch of 'not well made' sticky tilguls! Apart from the little drama caused by sticky tilguls, Pongal passed off peacefully with the usual delicacies - Venn Pongal, Chakra Pongal and Vadais. Sankranti is the time when the Sun passes from one zodiac sign to another and Makar (Capricorn) Sankranti is the transition of the Sun from Sagittarious to Capricorn. This time is celebrated in Maharashtra with exchange of tilguls. Pongal or Lodi mark the harvesting of crops (gathering of ripened crop) by farmers ,and prayers for a good future harvest is done on this day. The festivity is kept simple in terms of preparations because the idea is to thank the Earth for its generosity. Tamil Nadu: It is sugar cane harvesting time in Tamil Nadu hence offering sugar cane to Mother Earth is a must. One also prays that Spring ensures a good harvest in the future. Punjab: Punjab is the major producer of wheat in India. Wheat is a winter crop sown in October and harvested in March and April. 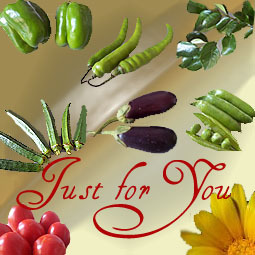 Sankranti is a time when the cold season comes to an end and spring promises a rich harvest in April. It is to celebrate the return of Spring and the promise of a rich harvest that Punjab celebrates Lohri/Lodi. In true Punjabi style the celebrations are marked with colorful dances around a bonfire offering revadi, peanuts and sweets. The culmination of winter harvest is celebrated as 'Baisakhi' in April. Venn-Pongal - Health factor - Very nutritious! 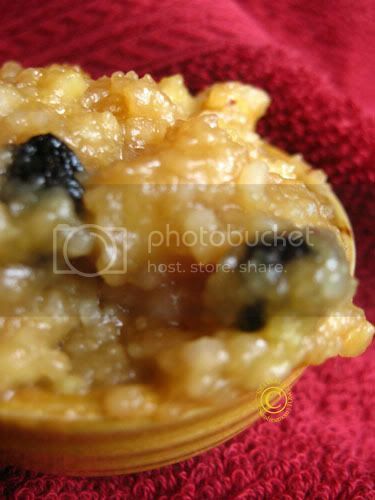 Clean and pressure cook rice and mung beans together till very soft. (I add 4 times water for the amount of rice + 2 times water the amount of dal). We do not want a hard mass. 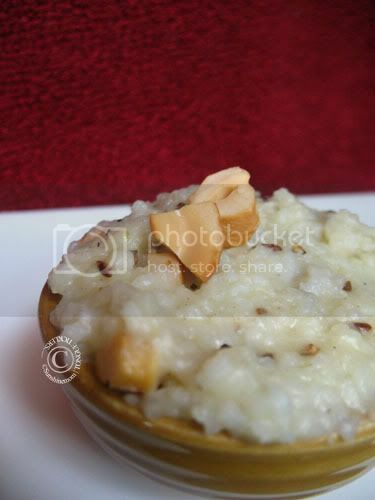 It is desirable to achieve a creamy pudding consistency like khichdi. Roast peppers and cumin seeds and powder the two coarsely. Set aside. Heat a tbsp. of oil and fry the broken cashews and set aside. Also roast the curry leaves till they crackle. When the rice+dal is done, remove and add the powder, the cashews and the curry leaves giving it a light mix. If the result is not creamy you could add boiling water to adjust the consistency. Generally a good amount of ghee is added. I do not add much but my children top this with a tsp. of salted table butter while having. Have it steaming hot and just out of the fire. It gathers into a solid mass because of the starch if it goes cold and doesn't taste nice so try and have it comfortably hot. Cashewnuts - broken - about a tbsp. 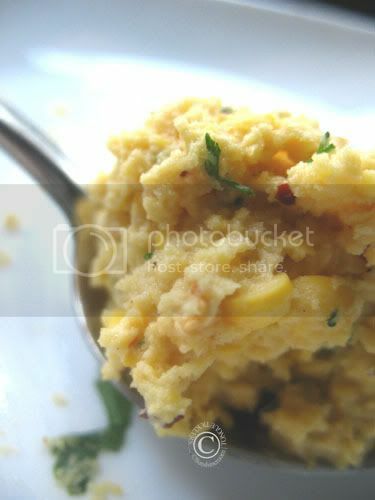 Cook rice and dal together till soft (not soggy or gooey but not separate either) in a cooker or pot. In a heavy bottomed pan heat a tbsp. of fat (I used margarine and you can't see the difference). Add raisins and fry till it changes color and plumps up. Remove with a slotted spoon and set aside on a kitchen napkin. Add cashew, fry till light brown, strain and set aside on a tissue. Now add another tbsp. of fat to the pan. 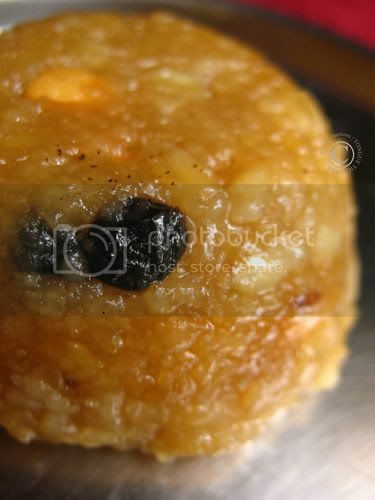 Add jaggery and the rice-dal mix and cook till the jaggery blends into the rice. It should come together but remain creamy. I add one more tsp. of fat at this stage and then remove. This should not take more than 3 tbsps. for a rich version. Add cardamom, cashewnuts and raisins. Mix and serve hot. 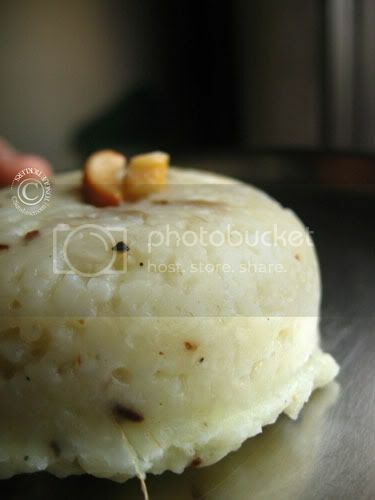 The more the fat, the tastier the pongal. The reddish or brownish appearance depends on the quality of jaggery used. Some jaggery varieties carry a lot of saltiness. This variety is not suited for chakra pongal, appam, or vella payasam. Organic jaggery is sweet, softer to powder and has a reddish color which is perfect for any jaggery preparation. The two pongals are my entry to Sudeshna of "From a Bengali's Kitchen" for her event Harvest:The Festival Of Rice. First grind the spices together to an almost fine powder. Add chopped coriander. I did not use onions as we avoid it during festivals but otherwise I pep it up with 1/2cup finely chopped onions and a tsp. of chopped dill to give a yummy flavor. Make small ping-pong balls out of the dough and flatten it to a disc in the centre of your palm so that it is a little thick in the centre and flat at the edges. These vadais are my entry to the seventh helping of My Legume Love Affair - a legume event started by Susan and this time hosted by dear Srivalli of 'Cooking 4 All Seasons'. 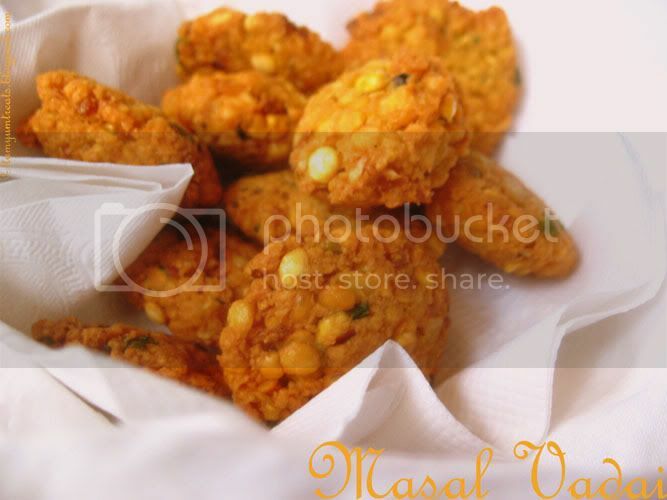 Generally I make ullundu vadais or fritters made of soaked urad dal which incidentally was my first post on TONGUE TICKLERS....... This time my daughter wanted these - she said - "this or that - vadai is vadai"! How does one go against that logic? I am not too keen on many things - like chakra pongal, but I make everything festivals traditionally demand as I want my children to be aware of the practices followed, and the reason behind each tradition. I make these just for them, so all the items here go to Alka - my dear friend from Sindhi Rasoi who is on verge of celebrating her first blog birthday, for her first event - Just for You! Note: Though I might have made myself sound like a glutton, tilguls or til vadis are nutritious, healthy laddoos (Zero oil, vegan,sweetened with jaggery) and you can afford to snack on two or three a day if they are made well without the thought of gaining weight and at the same time feeding your senses and your body! I found some good ones at Sinful Indulgences by Jayashree Mudaliar. I will definitely listen to my tummy hollering if I am sent some like the ones she made - it would be a sin to avoid them!